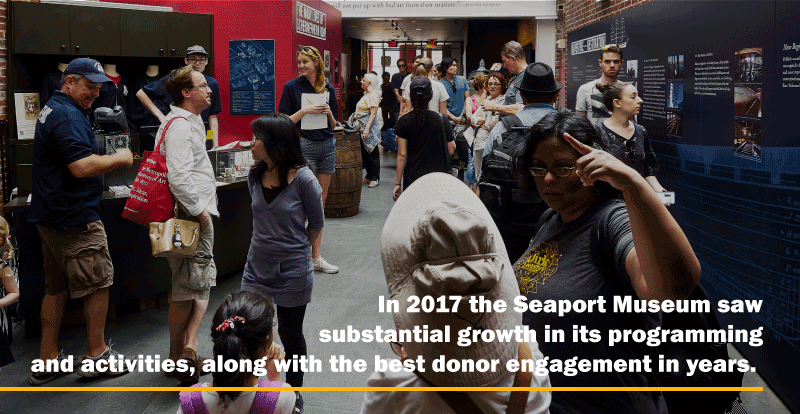 As we write this, the Seaport Museum is hard at work on ambitious plans for the future. Having celebrated our fiftieth year, we look forward to the next fifty and to a strong, sustainable, and energetically programmed Seaport Museum. With your help we will achieve these goals. This 2017 Annual Report—our first in recent history—details our achievements and activities in 2017 illuminates some of what 2018 and beyond have to offer. We thank you, our donors, for the support that has made this work possible and for your continued attention to our efforts to bring to life Where New York Begins. Our ship Wavertree returned to South Street after a $13M restoration and was open for the full year hosting visitors, musical performances, weddings, and education programs galore. Our September benefit event garnered more than half a million dollars in critical support, funds that were immediately supportive of educational and public programming that strengthens our mission, invigorates our community of friends, and emboldens our position as the Cultural Anchor of the South Street Seaport Historic District. Our schooners Pioneer and Lettie G. Howard sail New York and beyond, carrying students and the public on voyages of discovery. Our collections team delved still deeper into the more than 27,000 artifacts in the Museum’s holdings, providing content for two new exhibitions and resources for researchers, our public, and for our own understanding of New York’s port beginnings. Our 1930 tug W. O. Decker began a 7-month, $750,000 rebuild at Caddell Drydock in Staten Island and in 2018 will embark on an historic journey up the Erie Canal. And our 1907 lightship Ambrose began the planning for her unprecedented $5M city-funded restoration, a sort of Wavertree treatment for the lightship that will bring her back to her 1908 configuration and will complete the efforts begun more than six years ago to reconcile the fleet of ships.